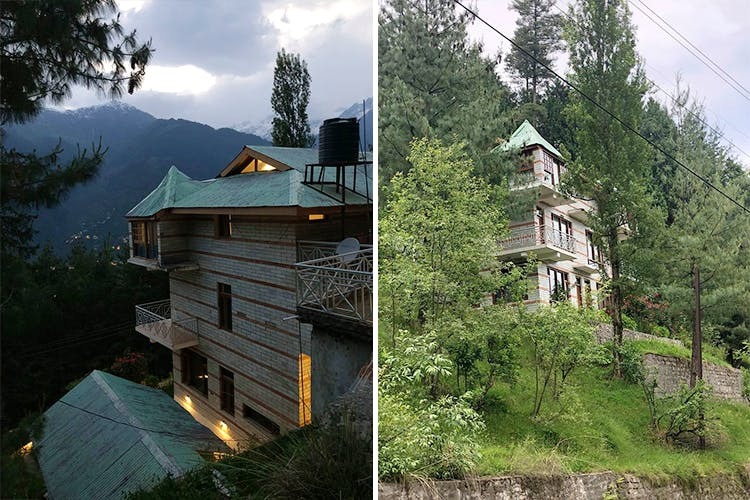 Wildloggers Villa is a gorgeous, five-bedroom cottage in Manali that caught our eye for its away-from-the-touristy-crowd location and affordable rates. Surrounded by the lush greenery, you can come here for stunning mountain views, comfy and spacious rooms and homey food that'll be served fresh and hot. The owners take pride in the villa being away from any commercial area. It's perfect for anyone in need of a rejuvenating break from any chaos. Come here with your squad (they can accommodate upto 15 people) and have a bonfire, play board games, visit a nearby cafe or laze around just staring at the view. You can also head to Humpta Pass (it's three kms away) or the Mall road (that's eight kms away). And, you get all of this for a pretty sweet deal. They'll charge INR 2,500 per night for a twin sharing room (inclusive of breakfast and tea for two). For an additional cost, their attendant will cook up fresh meals for you when you need. We wish it wasn't such a hassle to reach—it's hard if you don't have your own means of transport. We'd recommend it for when you're on a road trip, or if you're on a biking tour.